Developers of a four-state oil pipeline have agreed to halt construction of the project in southern North Dakota until a federal court hearing next week in Washington, D.C. 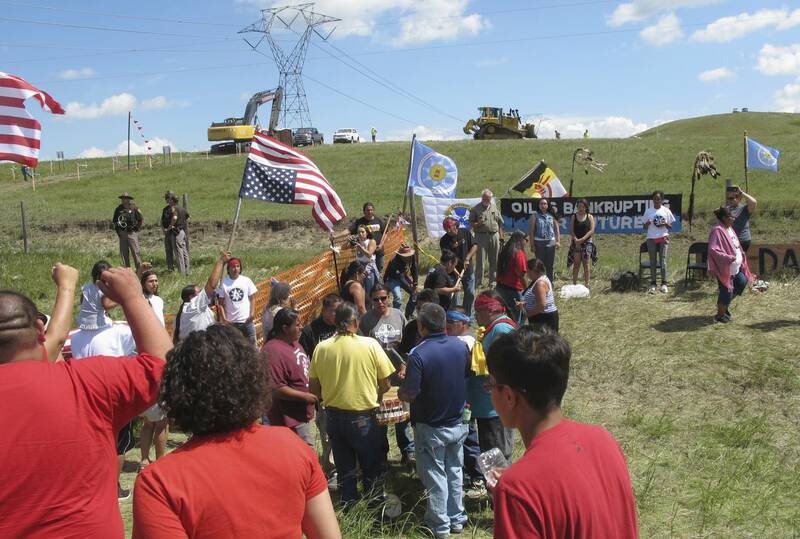 The temporary construction shutdown comes amid growing protests and increased tension over the Dakota Access Pipeline that is intended to cross the Missouri River near the Standing Rock Sioux reservation that straddles the North Dakota-South Dakota border. Dallas-based Energy Transfer Partners' Dakota Access Pipeline is a $3.8 billion, 1,172-mile project that would carry nearly a half-million barrels of crude oil daily from North Dakota's oil fields through South Dakota and Iowa to an existing pipeline in Patoka, Illinois, where shippers can access Midwest and Gulf Coast markets. The Standing Rock Sioux Tribe is suing federal regulators for approving the oil pipeline that would be the largest-capacity one carrying crude out of western North Dakota's oil patch. The tribes' lawsuit filed last month in federal court in Washington challenges the U.S. Army Corps of Engineers' decision to grant permits at more than 200 water crossings in four states for the pipeline. The tribe argues the pipeline that would be placed less than a mile upstream of the reservation could impact drinking water for the more than 8,000 tribal members and the millions who rely on it further downstream. The lawsuit, filed on behalf of the tribe by environmental group Earthjustice, said the project violates several federal laws, including the National Historic Preservation Act. The tribe worries the project will disturb ancient sacred sites outside of the 2.3-million acre reservation. The hearing on the tribe's request for a temporary injunction is slated for Wednesday. Mostly members of the Standing Rock Sioux tribe, but they've been joined by other American Indians and non-Native Americans from across the country. "Divergent" actress Shailene Woodley was part of the protests last week. American Indians have for months been staging a nonviolent protest at a "spirit camp" at the confluence of the Cannonball and Missouri rivers in the path of the pipeline. More than a dozen young people from the reservation also ran from North Dakota to Washington to deliver 140,000 petition signatures to the Corps to protest the pipeline. The protest took a turn last week when law enforcement was called to keep the peace between protesters and armed security guards hired by the company. Twenty-eight people have been arrested since then and charged with interfering with the pipeline construction, including Standing Rock Sioux Tribal Chairman David Archambault II. Developers on Monday sued in federal court to stop protesters, alleging the safety of workers and law enforcement is at risk. The company said the pipeline would include safeguards such as leak detection equipment, and workers monitoring the pipeline remotely in Texas could close block valves on it within three minutes if a breach is detected. Energy Transfer Partners announced the Dakota Access pipeline in 2014, a few days after North Dakota Gov. Jack Dalrymple urged industry and government officials to build more pipelines to keep pace with the state's oil production, which is second only to Texas'. Supporters said the pipeline would create more markets for the state's oil and gas, and reduce truck and oil train traffic, the latter of which has been a growing concern after a spate of fiery derailments of trains carrying North Dakota crude, including one near Dalrymple's hometown of Casselton in 2013, and an explosion in Quebec that same year that killed 47 people.